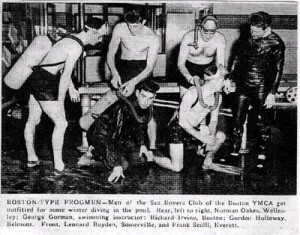 Early Sea Rovers practicing at the Huntington YMCA during the winter months. 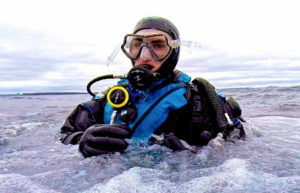 Bob went on to a great career in the underwater world, finding the Titanic and many other famous shipwrecks, and he presently heads the Institute for Exploration at the Mystic Marine Life Aquarium in CT. The Boston Sea Rovers are proud sponsors of our Underwater Clinics, the last major dive show in America run solely by volunteers. Proceeds from the Clinics are used for scholarships, internships, in support of other non-profit organizations (in particular SeaMark, and the Cotting School for Handicapped Children), and to continue and promote the goals of our organization. Included on this website is a brief glimpse at the illustrious history of our club. We are currently working on a detailed written history of our organization, that includes hundreds of photographs accumulated over the years. Details will be posted here at a later date when the tome will be available for download.